It’s interesting how things work out; Anthony Gormley’s One and Other Fourth Plinth project in Trafalgar Square could be described as us members of the public “making our own damn art”. Actually, “Make Your Own Damn Art!” is a call to action that I associate with Bob & Roberta Smith another of the artists who was a shortlisted for the Fourth Plinth Project. Earlier this year I led some Saturday art club sessions at the Mead Gallery, Warwick Arts Centre. At the end the children’s “Common sense with attitude” billboards were displayed in the gallery alongside Bob & Roberta Smith pieces and it was fun to discover that some of the gallery visitors were unaware that any had been made by children! I was in London this weekend and synchronicity would have it that two people that I know Deirdre Figueiredo, Director of Craftspace and Kate Durrant, Lichfield District Council’s Civic Secretary) had their slots on the plinth not only on the same day but actually with time slots next to each other. Deirdre was promoting the Slow Movement in crafts and also promoting a more sustainable lifestyle by recycling an old knitted jumper. I’d already chatted to Kate and knew that she planned to make a set of panoramic drawings. I first met Kate about 15 years ago at Lichfield College where she was one of the art tutors and over the years we have occassionally been in life drawing classes together. She is really talented and I look forward to seeing the finished work. During Deirdre’s session on the plinth there was a buzz of activity amongst friends and family who had come to support her in the community act of making. I’d intended to bring along my “never to be finished” Kaffe Fassett needlepoint tapestry (I’ve being doing it very sporadically over the last 21 years!) but I forgot so was very glad that my friend Jane Porter brought me this lively day-glo orange yarn and some needles so I could get clicking. On the webcam of Deirdre’s session you can hear the buzz of chatting from the crowd below; there’s nothing like a group of people sewing patchwork, knitting, crocheting and embroidering to draw people in and start off conversations. -Mary Spyrou a writer and tutor (at the Morley College) specialising in textiles from diverse cultures. She is interested in traditions and techniques and I guess takes an anthropological approach to textiles. I mentioned learning to knit with three needles while I was in Shetland when I was a teenager. -Kei Ito made Deirdre’s wonderful costume. It was perfect to wear on the plinth as it swayed gently in the breeze and reflected the light from the spotlights. It certainly gave her an etherial presence. I have experimented with nylon bias horsehair hemming braid similar to that used by Kei Ito to make this costume but Kei Ito is an exceedingly talented designer and costume maker who has taken this material and many other unlikely materials to the heights. See her wonderful sculptural costumes and wearable art pieces here. Here is Kei Ito dressing Deirdre in her "back-up" costume (she had come prepared with dry weather and wet weather options). While on the plinth she explained a bit about Craftspace's mission to develop people, ideas and opportunities through contemporary craft. She read some excerpts form “The Craftsman” by Richard Sennett. And just as her hour was drawing to a close she started to cast on her new garment to continue the story of the reclaimed yarn. Exceedingly brave of her as she had only just learnt to knit the day before and now exposed to the world on the Sky Arts webcam she was practicing what she was preaching- learning a new craft and joining the community of artists, artisans, and general members of the public who enjoy the therapeutic and satisfying activity of making with their own hands. And of course, she had got us all involved in making our “own damn art”. Once back home, I watched the video and felt that she had very cleverly linked together performance art, with oratory and education. And by inviting others to bring along work to make, had also magnified the energy by making it a collaborative event; a piece of art that I feel Antony Gormley would be proud of. 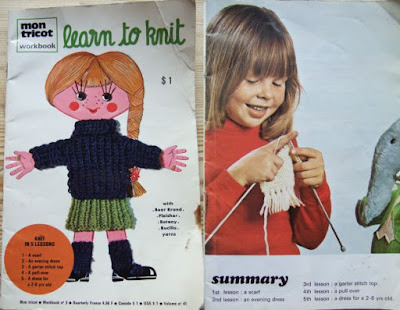 Should Deirdre require anymore refresher lessons on knitting I could lend her my own precious knitting book. My nan Jessie Graham gave it to me when she taught me to knit when I was six years old. Really like your blogging an much appreciate the links especially the slow movement stuff - a timely and thought provoking reminder of what being human is all about. Are you currently wearing a day-glo orange bobble hat?! I have the crochet book in the same series too and any time I have to crochet I do have to refresh my memory from it. No bobble hat yet Barb but I do still have my first ever piece of knitting and first ever piece of crochet still. They are wearable... by dolls. It was great to meet you at the plinth too! Your orange yarn from Jane was perfect for the grey skies. I would have loved to try that giant viccie sponge from your post too. Good luck with your next venture, sounds like you'll be busy!